Life can either make you Bitter or Better. From a crucible of unimaginable suffering came a survivor – Antwone Fisher*, The man the movie of the same name was made about, directed by and starring Denzel Washington. What a gift he shares in it: The advice he never got from the dad he never had. Brimming with insight, it shows his suffering was not in vain. He held a raffle for a gorgeous tie too. Antwone reached in and picked out the winning ticket – and as fate would have it, a young student, Marcus, got it! I’m so glad he won – he was so happy! 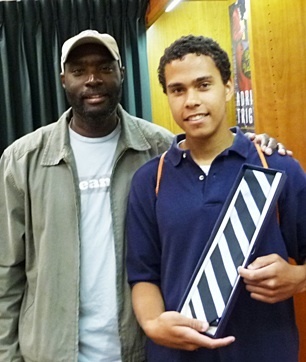 Antwone Fisher (L) with the young man, Marcus, who won the TIE at the Vroman’s book signing event. 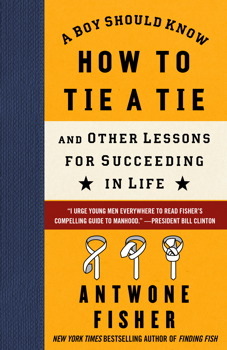 Have you heard about Antwone Fisher? Have you seen the movie? The movie, Antwone Fisher, directed by and starring Denzel Washington. By the way – Preventing child abuse starts with everyone. We are all dominos that affect those around us. GoMommyGO has tools to help parents learn to manage their kids’ behavior from a proactive standpoint. Visit for free behavior charts that REALLY WORK! Great teachers speak in parables. Stories can change the character of the people who hear them – for the better. That’s what our non profit, EDU DESIGNS aims for in our media for children. Thanks for your support of what we do.